he Titan anvil, designed for the blacksmith, bladesmith, and metalsmith is equally well-suited to the jeweler. 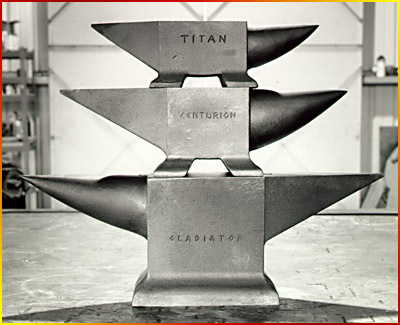 Because of its exceptionally thick waist, the Titan anvil provides maximum striking resistance in a smaller anvil size. The 1" square hardie hole provides a substantial receptacle for tooling. Each anvil individually dressed by Jim Garrett. 24 3/4 inches / 62.9 cm. 7 inches / 17.8 cm. 5 inches / 12.7 cm. 11 inches / 27.94 cm. 1 inch / 2.54 cm. 5/8 inch / 1.6 cm. 120 lbs. / 54.4 kgs.